The Ibex Men's Woolies 1 Zip Neck is made with lightweight 165 g/m2 New Zealand Merino Wool that gives it just the right amount of warmth for strenuous activity while keeping it highly breathable and quick drying. Its 18.5 micron fibers are incredibly soft, yet they're durable enough to handle the abuse of cold-weather activities. Flatlock seams and a tag-free construction let Ibex's Woolies baselayers sit right against the skin without any irritation. Winter is not my favorite season but I still want to ride when I can. I bought this base layer and have been very happy with it. The fabric is thin but surprisingly warm. 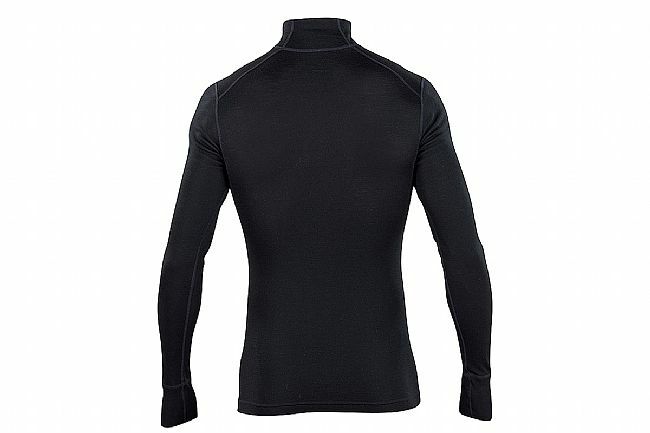 Perfect for a coolweathe baselayer. Lightweight yet warm. Easily packable. Thin but reasonably warm. Feels good against skin. I like the snug and stretchy fit. More durable than Smartwool, which is likely made from shorter cheaper fibers. Lastly and most remarkably, it's highly stink-resistant. This makes it excellent for vacations. Other woolens (even Ibex) may not have these properties. Can't remember why I bought the first one, but now I have a bunch. Keep from moths.